Growing up, author Tidimalo Manyaapelo enjoyed reading romance books like many of her peers. She was almost sure she was one day going to be a Mills & Boon author. She later realized that though the knight in shining armor plot with a happy ending filled her with joy, it was not real. She wanted her writing to depict life as she saw and experienced it. Born in Driefontein, South Africa, Tidimalo is concerned about women, South African women specifically, and the many ways women resist oppression and make their voices heard. Her novel, A Bus Ride Home reflects this concern, as did our interview with her. ABR: As a writer, what sources do you draw inspiration from? TIDIMALO: I draw inspiration from other books, magazines, and whatever else is around me. I get inspired by events that talk to me as a person and what I believe in. ABR: Your writing seems to be nestled in a South African environment? To what extent does your environment influence you? TIDIMALO: Yes, I’m influenced by South Africa. I write about what I see happening around me. This refers to my own personal experiences as well as other people’s experiences. South Africa has provided a platform for women’s voices to be heard, for women to be treated equally as their male counterparts, yet women continue to be abused and undermined. While some women can be heard, there are still attempts to silence women who seem to be vocal. These women sometimes have to suffer character assassination meant to put them in their places. Women believe they have power and equality, and yet they still have to live with men who abuse them emotionally, men who prefer polygamy and men who expose them to risks of being infected with Sexually transmitted diseases. ABR: Do you think being a woman writer adds to that experience or does it make it harder to write within that environment? TIDIMALO: Being a woman is always challenging, regardless of what you are doing – my opinion. As a writer, the challenge becomes whether you want your voice to be heard or you want your voice to sound right. In my case, I believe I want my voice to be heard. ABR: Do you have a favorite African author or book? TIDIMALO: I honestly do not have one particular author or book that I can say is my favorite. I admire different authors for a number of different reasons. I enjoyed reading Sol Plaatje’s Mhudi firstly because as an English/Setswana translator, I look up to people like Sol Plaatje, who was the first English/Setswana interpreter and translator. I love that in 1919, there was a man who had it in him to portray such a strong and resilient woman character in Mhudi. In Setswana we have a saying ‘Tsa etelelewa ke e tshegadi pele, tsa wela ka lengope’ which basically means women cannot lead. I am proud that a Motswana man was in 1919, aware that women could be and do whatever it was, they wanted. We have many Mhudis today leading on their own or supporting those leading others. Another book I can mention here is Waris Dirie’s Desert Flower. Waris is resilience and courage epitomized. She became the voice of the voiceless and risked being denounced by her own by revealing the inhumane treatment young girls were being subjected to in her home country and many other countries. I admire women who, despite their sufferings, rise up and strive to better their conditions and that of others who may be destined to the same fate. I believe that no woman should be married to a man she doesn’t love the same way that I don’t think women should be objects of male pleasure. ABR: Tell us a bit about A Bus Ride Home. 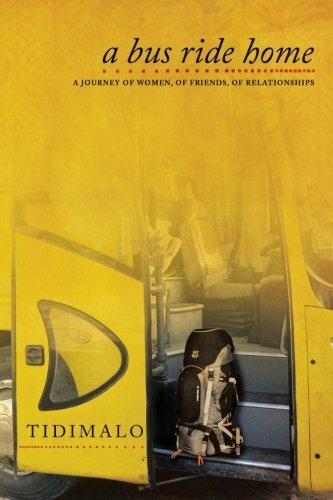 TIDIMALO: A Bus Ride Home is a novel about young romance that rekindles in maturity, thereby triggering a long reflective journey. It is a woman’s personal journey. Through Tlotlego’s personal journey, the reader is also taken through the lives of her friends. There is Pelontle who is eccentric and adventurous but fears marriage, Amantle who is nursing an ungrateful HIV positive husband as well as Kgopolo who is forced to downgrade her opulent lifestyle after her divorce. This, I believe is a story of every woman. Tidimalo Manyaapelo has written dramas for Radio Mmabatho and Motsweding FM. She has also written educational programmes for SABC Education Radio including I’special, I’spani and Takalani Sesame. She currently manages her own events management company, Td Concepts. She blogs at www.tdmalo.blogspot.com where she discusses modern issues from a feminine perspective. An avid hiker, A Bus Ride Home is her first novel.